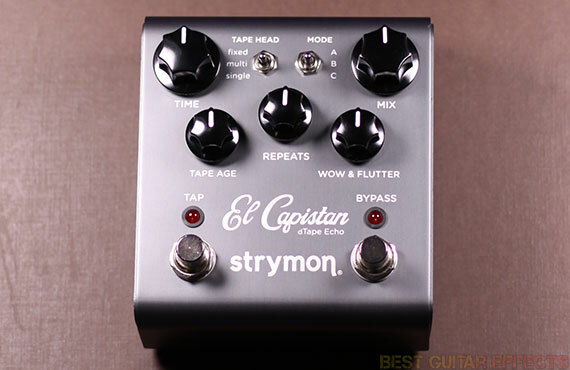 Strymon El Capistan dTape Echo Review – Best Tape Echo Delay Pedal? Echomatics, Echoplexes, Echorecs, Copycats, and Space Echos are a few of the legendary and highly sought-after machines synonymous with tape echo. While the lucky guitarists who’ve ever played through any of these units will surely attest to the amazing tones that can be coaxed from a well-maintained and serviced tape echo unit, many modern guitar players would benefit from a more practical and portable means to achieve similarly great tape echo effects. Many guitar pedals have attempted to emulate these classic delay effects with varying degrees of success. Fortunately, the wizards at Strymon took to the task of creating a worthy tape echo style delay in a convenient stompbox pedal enclosure. The result of their efforts is the El Capistan dTape Echo. The El Capistan dTape Echo is quite possibly the most ambitious attempt at creating a faithful digital emulation of classic tape echo units in a dedicated compact pedal. Featuring 3 separate tape machine selections, each with 3 dedicated modes of operation, 10 knob adjustable parameters, tap tempo, an expression pedal input, and more, the El Capistan offers unparalleled control. Housed within the pedal’s humble enclosure lies an incredibly powerful SHARC DSP processor, ultra high quality 24-bit 96kHz A/D and D/A converters, and an all-analog dry signal path for blending the impeccable tape delay sounds with your pristine original dry audio signal. While not actually a real tape delay in the traditional sense, the El Capistan might just be the next best thing and perhaps and better in some ways. Is this the best tape echo delay pedal around? You’ll find out in our Strymon El Capistan dTape Echo review. 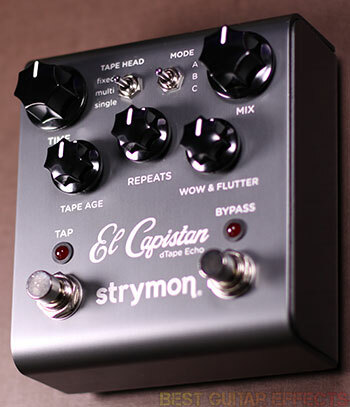 Visit Strymon for more info about the El Capistan dTape Echo. I’m going to cover my impressions of the El Capistan’s 3 different Tape Head settings along with their various Modes and then dive in for deeper explanations of how the pedal’s other functions affect the overall tone. My primary testing gear is a Fender American Standard Stratocaster and a Rivera Venus 5 amp. The Fixed Tape head offers straight ahead delay echoes by simulating a playback head in fixed position with varying delay times from the Time knob and the 3 available modes. With the El Capistan’s Fixed Tape Head selected, Mode A provides shorter delays, great for dialing in a slap back delay that can be easily set to 1/16th notes via tap tempo. You’ll feel like you’re ready to board Elvis Presley’s Mystery Train. Mode B and C provide longer delays with dotted 1/8th notes and ¼ notes, respectively. Mode B is especially fun for creating percussive rhythmic patterns. Of course if rhythmic tape delays are what you’re after, the Multi Head setting might be your preferred destination. The Single Tape Head simulates the effect of a machine with fixed tape speed. The delay time is changed by adjusting the position of a sliding record head via the Time knob. Mode A and B give you a choice between fast and slow tape speeds, Mode A being more hi-fi sounding and pristine as would be the case when recording at a higher tape speed with an analog tape machine. Mode C provides an additional treat worth checking out, a Sound on Sound tape delay recorder/looper. The first 2 presses of the Tap footswitch set the first and second splice points for the length of your loop, continuously recording and looping with each pass. A third press performs a bulk erase of the tape for an instant reset. The Time knob lets you select between normal and double speed settings. It’s also a blast taking a loop at double speed and switching to normal speed to drop it down an octave or doing the reverse to create some weird musicbox-like octave up effects. One of the greatest miracles the El Capistan offers is being able to perfectly sync authentic sounding tape echoes to your music via tap tempo, an essential feature that ensures you’ll always be able to easily replicate precisely timed delays in a live situation. This feature works as expected and is one more feature that none of the classic echo units of old can contend with. As for tonal tailoring of your delay, the El Capistan has several useful parameters that let you fine tune your sound. I’ll start with what’s plainly visible. The Tape Age knob sets the tone of your delay, simulating the effect of tape and the darkening of tone that come with age. Setting the knob all the way counterclockwise produces the clearest, most full range sounds, giving the El Capistan a more modern vibe. Turning the knob progressively clockwise darkens the sound for warmer and more vintage analog sounding delays. The Wow & Flutter knob produces natural sounding tape modulation that sounds great if you like a little movement in your delay. Subtle use of this knob produces pleasing results across all the El Capitstan’s modes of operation. There are 5 more parameters available for shaping your sound accessible with the 5 surface knobs by pressing and holding both the Tap and Bypass footswitches. While it may require a bit of dexterity to tweak the “hidden” parameters in a live situation, these may be adjustments that you simply set and forget. The Low End Contour setting reduces the low frequencies, giving your dry tone a bit more punch, especially useful with longer Repeats settings when you’d still like to retain some note definition. At extreme settings you get high-passed, metallic sounding magnetic drum repeats. The Tape Bias parameter reduces headroom and echo volume when turned clockwise. I find the effect on the overall sound very subtle, but it’s worth experimenting with especially if you use it in conjunction with the Tape Age and Low End Contour for really precise tweaking of your preferred tape echo sound. Tape Crinkle adds various artifacts to your delay, giving you sounds of mangled tape. It combines well with the Wow & Flutter for adding imperfections to your sound, great for delays that aren’t perfect and pretty all the time. Of course, these imperfections are things of beauty in and of themselves. There’s also a Boost/Cut function that provides +/- 3dB of boost or cut when the pedal is engaged, especially useful if you’d like to make your guitar stand out just a little bit more when you activate the pedal. And finally, the Spring Reverb function sets the mix level of the integrated spring reverb tank in any of the delay modes. The El Capistan’s Spring Reverb is one of my favorite features of this pedal, potentially negating the need for an extra reverb pedal on your pedalboard if you find yourself typically using reverb and delay at once. The Spring Reverb is brilliant at making your tape delay excursions that much more surreal and atmospheric. You can crank it to drown your delays with reverb or use it mildly to add a little more dimension to your echoes. The El Capistan also has an expression pedal input for controlling any one of the surface control knobs in real-time, great for adding interest to your delays when used to modulate Time or Repeats. 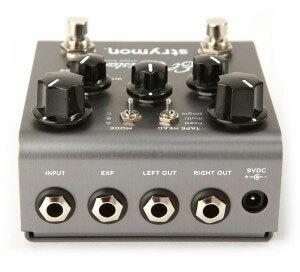 This input can also be used with Strymon’s “Favorite” footswitch for storing a preset for instant recall at any time. There are also 2 stereo outputs on the pedal as well as a TRS stereo input jack. My only initial concern about the feature set of the El Capistan was whether or not it had a stereo input. Thankfully, it does (Strymon added the stereo TRS input in May of 2012). The El Capistan’s stereo input is activated by flipping an internal jumper and requires a standard TRS cable to use. 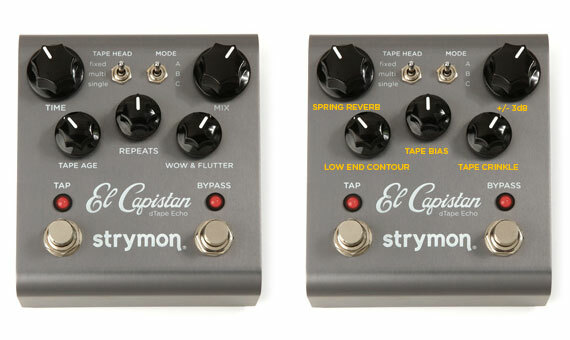 If you like to use stereo modulation effects in front of a stereo delay, the El Capistan has you covered. The El Capistan has been around for a few years already and is still the tape echo delay pedal to beat. Also, check out the Strymon TimeLine and Strymon BigSky pedals for more tape echo inspired tones. The TimeLine has a dTape machine, and the BigSky has the cool multi-tap Magneto. Let’s see the final result. The Strymon El Capistan dTape Echo is one of the most outstanding delay pedals I’ve ever played and offers some of the most inspiring tape echo sounds you’ll ever find in a compact stompbox. This pedal is simply loaded with great delay effects and reveals an even greater treasure trove of tone to those who dig below the surface. If you’re looking for the best tape echo delay pedal around, the El Capistan should be at the top of your “must try” list. That concludes our Strymon El Capistan dTape Echo review. Thanks for reading. 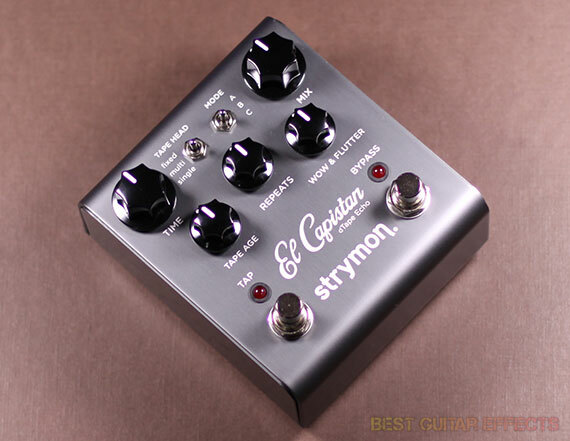 Want to buy the Strymon El Capistan? I have been a performing musician for many a years. I’m a lead singer and guitarist. One of my guitar styles is the old “Shadows” sound. “The Shadows” were a British guitar group with the famous Hank B. Marvin on lead guitar. His guitar sound were based on tape echoes and the El Capistan give me this in a modern form. Over the many years I have tried many echo / delay units, but none could reproduce all of the echoe types the different Shadows tunes require, including “Atlantis” with its unique intro. Strymon, in my opinion, makes the very best echo and reverb units for a price that almost every musician can afford. Oh, by the way, I’m using their “Blue Sky” for my vocals…it’s like having a studio reverb on stage! Just got this today and it’s Mind-blowing!!!! If you need Delay Buy Strymon! And that’s why i’m going to get TWO of these bad boys & see what i can create. This would be perfect for a ‘Reine Fiske’ kinda sound…. This is my favorite tape delay and the fact that there is a looping function makes it worth every cent.